Reaching rural audiences for $10.71 per visitor, the “Van of Enchantment” brings cultural history to schools and public events in New Mexico — at no cost to visitors. New Mexico’s rich history traces back at least 11,000 years, and includes a flourishing Pueblo community in the 13th century, Spanish conquistadors and colonists in the 16th century, and railroads in the late 19th century. The van averages nine venues a month (see 2011 schedule), mostly targeting schools during the school year, and filling in the schedule with libraries in the summer. A quarter of venues are public events. The map at right shows how venues are distributed around the state. Mann says, “we try to go to as many events in as many different places as we can without completely exhausting our staff.” They need to choose events that will fit their large truck, have a large enough crowd to be worthwhile, but sufficiently rural that they reach their audience. Mann says, “we really try to balance big events with getting out to the rural and underserved areas. When possible, we like to participate in events with a similar theme as our exhibits. 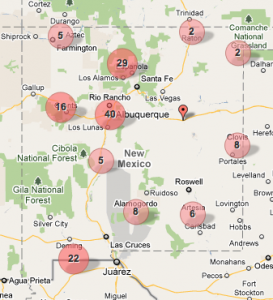 For example, this summer we will bring Road Trips to an event in Grants, NM sponsored by the New Mexico Route 66 Association.” Other venues include an Earth Day celebration, the Truth or Consequences Fiesta, the Clayton Lake Trout Derby, plus some huge events like the State Fair or the Balloon Fiesta where they keep the van open for 10-12 hours per day over several days. Normally, they operate with just the 2 staff on the van, but they occasionally recruit volunteers who meet them at very large events. Public visitors are invited to do crafts activities that relate to the exhibit, such as using pump drills to put holes in seashells for necklaces (prehistoric trade routes), making God’s Eyes (trade routes between US and Mexico), or designing postcards. At schools, van educators give students artifact exploration worksheets to work on individually or in groups. If time is available, they have students ‘teach’ the staff about the artifacts they just studied. Younger students do an artifact scavenger hunt, scouring the van for actual artifacts that match photographs. (See also technical details for schools, PDF). 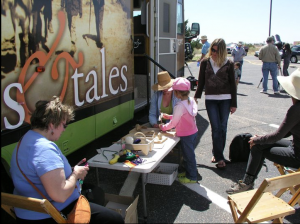 In fiscal year 2010, the van served 20,655 visitors (two-thirds being kids). The van is run by two educators/drivers. The current budget is $221k/year, which is a cost of $10.71 per visitor. Half of that cost includes designing & fabricating a new exhibition in the van each year, to keep it fresh. See budget breakdown at right. The van started in 1996, and has been supported by various grants over the years. (In lean years, the van visits fewer sites). Artifacts are provided by the History Museum. The van is run by the Department of Cultural Affairs (DCA). They operate one mobile museum, and are about to replace the original RV. There are two full time staff (Mann, a contractor, runs the program; and Jamie Brytowski, a full time state employee, is lead educator). Four part-time educators take turns joining Jamie on the van, each working 100-200 hours a year. In a stroke of brilliance, current funding for this RV that travels the highways of New Mexico comes via the NM Department of Transportation. 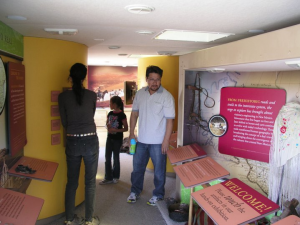 The collaboration between DCA and DoT started with a small 2004 exhibit at the Museum of Indian Arts and Culture in Santa Fe, about highway Archeology (New Mexico started the first U.S. state highway archaeology program in 1954). A subset of that exhibit was installed in the van. 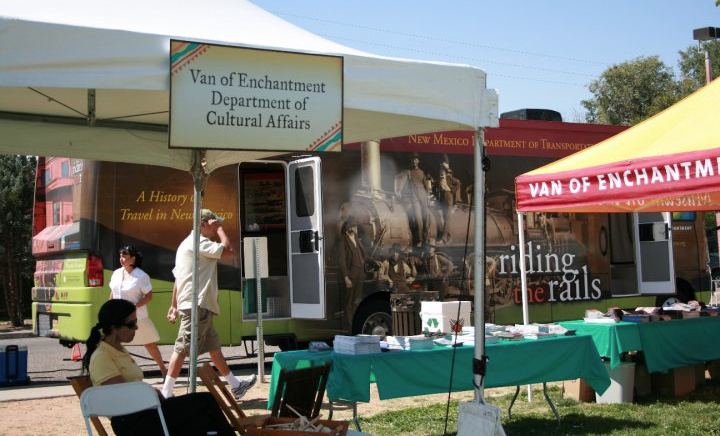 Staff and visitors were so pleased with the small traveling exhibition that when a recent grant was given to DoT, they invested in the Van of Enchantment. Outside of Manhattan, New York City has surprisingly isolated communities. According to Rebecca Taylor, the program coordinator, if you ask a group of kids in the Bronx, “who’s been to a museum before?” almost all will say yes. But ask the same question in Far Rockaway (Brooklyn) or the corners of Staten Island, and many students will say no. Dependent on free buses or public transport, NYC schools far from downtown rarely go on field trips to museums because the timing does not work out. To reach the corners of NYC, Moveable Museum staff get started driving their trucks at 7am. Curator-in-chief George Sherwood wrote in 1927 that he was proud to be “helping to mould and prepare the most important building material in its structure — the interest of children — for the growth and development of the institution is absolutely dependent upon the support and confidence of public opinion. There are no more potent factors in shaping this public interest than the children’s influence in their homes. Often ‘Sonny’s’ enthusiastic description of the dinosaurs, birds at home, or big creatures of the sea is father’s first knowledge of the existence of the American Museum of Natural History, while at dinner the tales of travels to foreign lands, or glimpses of the wonders of nature through our lantern slides and films, serve to intensify father’s and mother’s interest in the work of the Museum. Finally, the children of today are the citizens, taxpayers and officials of tomorrow, and the impressions of school days carry over into private and public life.” They also had hands-on activities for blind students to touch specimens. 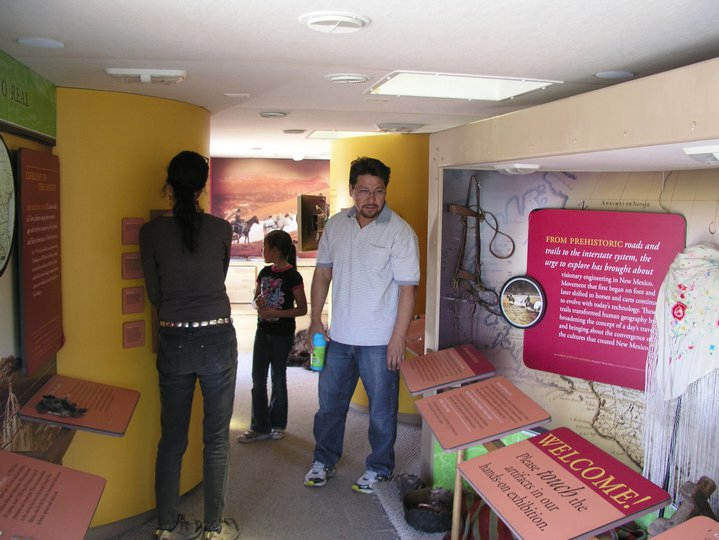 The current mobile museum program started in 1993. Initially a consortium program with local museums, in 1998 the AMNH created the Dinosaurs truck independently. The photo at left is from inside the Dinosaur (Paleontology) van. During most of the school year, the trucks go to schools. In June, schools tend to be chaotic, so instead they go to local libraries, and local classes walk a few blocks to the museum truck. In the summer, the Moveable Museum trucks go to summer camps at school buildings, community centers and churches. At a school, they reach up to 120 students, and students have assignments related to their visit. Fifteen students visit the truck at a time. In the summers, a truck may see up to 300 students per day, though the visits are more fleeting, often as short as 5 minutes. The program requires all participating teachers to attend professional development at the museum, which is scheduled between semesters. The Moveable Museum targets students of various age levels, and has activity packs for classes which are shaped to fit New York curricula. Funding is all corporate sponsorships. They aim for one funder per truck, but when money is tight, they accept partial sponsorships. Corporate sponsors (e.g., “Bloomberg”) get several benefits: Advertising via their logo on the truck that travels the city, bragging rights for their publicity documents, and typically the truck will attend a funder’s annual functions. At it’s peak, the Moveable Museum program had 9 staff (one coordinator, and two educators each for four trucks). Currently, they have 5 staff, and they shuffle among the trucks. The four educators have grueling hours, and tend to be in their mid 20’s to early 30’s. Taylor says that one of the perks of the job is seeing so much of the city. Educators venture into nearly every neighborhood in the city. 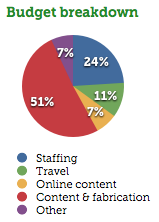 The largest cost is staff. The four educators are each paid around $35-40k/year. AMNH’s exhibit team fabricated two of the exhibitions, and two were outsourced to a fabrication company. Each truck’s expenses (e.g., books and handouts, minor repairs, maintenance, fuel, materials, supplies) is around $50k per vehicle per year. Go van Gogh (Dallas Museum of Art) — A school outreach program that brings art to 1st through 6th grade students in schools throughout North Texas. VanGo! (Susquehanna Art Museum) — Started in 1992, follow the school year (September through July), bringing original works of art to schools, community festivals, business, and retirement centers. Know about other programs? Leave a comment! Update: 30 April 2011: Minor adjustments to clarify that the two programs are free to visitors, and other minor wording changes. At LACMA (the Los Angeles County Museum of Art) we have the Ancient World Mobile and the Maya Mobile: two traveling classrooms from LACMA. Visiting 6th and 7th grades, students make art on the trucks followed by a field trip to the museum. The Maya Mobile started in 1997, the Ancient World Mobile in 2003. Both programs are offered for free to schools; visit http://www.lacma.org for more information. Hi Miranda, thanks for sharing info about LACMA's traveling classrooms! What a wonderful mobile museum/example. Thanks for posting it. Check out the SAM Academy On Wheels (Science, Art, Music) – http://www.cvsamacademy.org; SAM Academy is a sponsored program of the Fresno Art Museum. The programs mission is to bring science, art, and music to children in the underserved rural communities of California's Central Valley. Fundraising is underway to support further outreach. Brilliant post! I will wish to hear more regarding it within a future, more detailed information. I love the idea of mobile museums. Especially if you can manage 3 or 4 at the same time. Sure it requires a lot of time and money but you can use reporting tools to keep everything in check and make some profit fast too. This is a great way to actually preserve history and museums as well, as it isn't given much attention anymore by the younger generation. 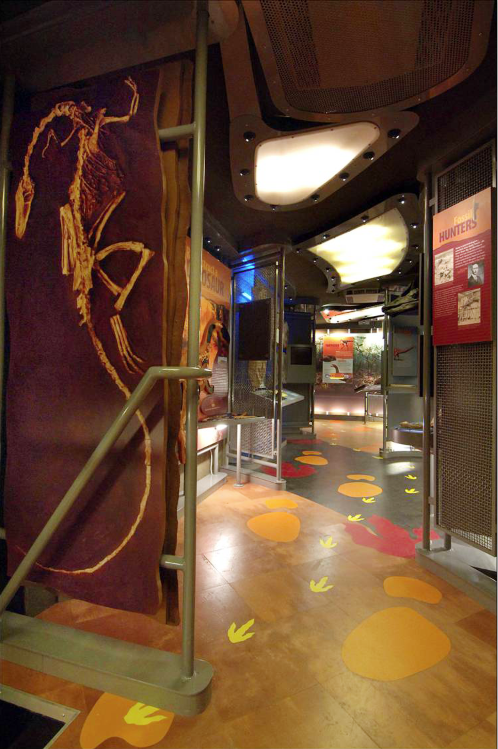 Complete with big truck glass, spacious interior and customized design, you would really feel the unusual learning experience on these mobile museums. See "Shark in a Bus"